This textbook is suitable for the following courses: Money and Banking and Financial Firms and Markets. 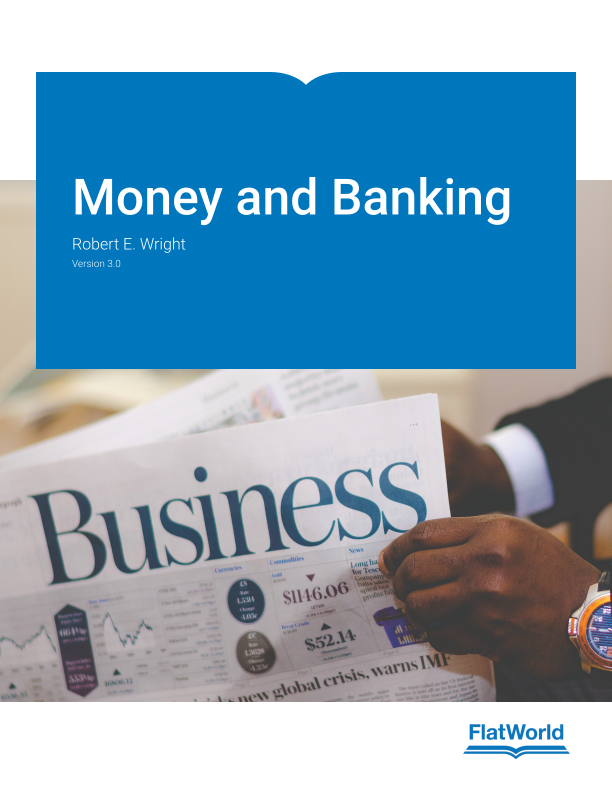 Wright discusses the subject of Money and Banking in a succinct and clear format for students. Leaving the more difficult mathematics for your classroom, the textbook covers all of the major topics and recent coverage. Version 3.0 features a new section that describes and assessed Islamic banking and insurance and includes up-to-date graphs to the latest available month or quarter. New section on Islamic Banking and Financial Stability. Updated time-series graphs through the end of 2016. Added discussions of regulations and central banking practices. Learning Objectives to introduce each chapter. “Stop and Think” boxes to better extend concepts to new areas. Practice exercises on mathematical concepts. 2.1 Evil And Brilliant Financiers? 4.5 What’s The Yield On That? 24.2 How Important Is Monetary Policy? 25.2 Why Have Central Bankers So Often Gotten It Wrong? Robert E. Wright accepted the Nef Family Chair of Political Economy at Augustana University in 2009 after a decade of teaching economics at the University of Virginia and New York University’s Stern School. He received his Ph.D. in Economic History from SUNY, Buffalo and is the co-author and co-editor of almost forty books, including Wall Street Journal’s Guide to the 50 Economic Indicators and Guide to the U.S. Economic Policy.